which narrows the vessel passage and reduces blood flow. 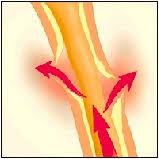 When blood pressure is too high, it can damage blood vessel walls which results in scar tissue. 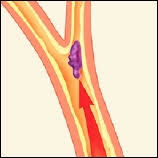 Fat and cholesterol (plaque) collect in the damaged spots. Blood cells stick to the plaque, forming a mass called a clot. 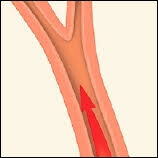 A clot can block blood flow in the vessel. Sometimes blood flows with enough force to weaken a vessel wall. If the vessel is small or damaged, the wall can break. When this happens, blood leaks into nearby tissue and kills cells. Other cells may die because blood cannot reach them. Each day that your blood pressure is too high, your chances of having a stroke are increased. Normal blood pressure is considered to be less than 120 over less than 80 millimeters of mercury (mmHg) or 120/80 mmHg. 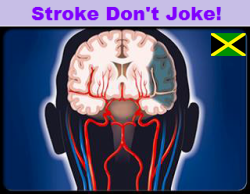 A stroke is a loss of brain function caused by a lack of blood to the brain. Stroke can result from the damage that ongoing high blood pressure causes in your vessels. If the affected vessel stops supplying blood to the brain, a stroke results.